If you’re a technology investor brushing off after the market meltdown, you might have noticed a slightly altered landscape. At the same time, there’s been a mild cooling off in passions for the cohort that has dominated since 2015. Despite a few headline-grabbing buys by big firms, fourth-quarter filings showed professional investors mainly jettisoned the FANG group of Facebook, Apple, Netflix and Alphabet. Maybe it doesn’t add up to much — after all, paring stakes is natural when part of your portfolio swells. With the Nasdaq 100 Index up four straight days, the selloff is starting to lose its teeth. But the question is worth asking after the trauma of early February: after its rally, is the clock ticking on last year’s most profitable trade? 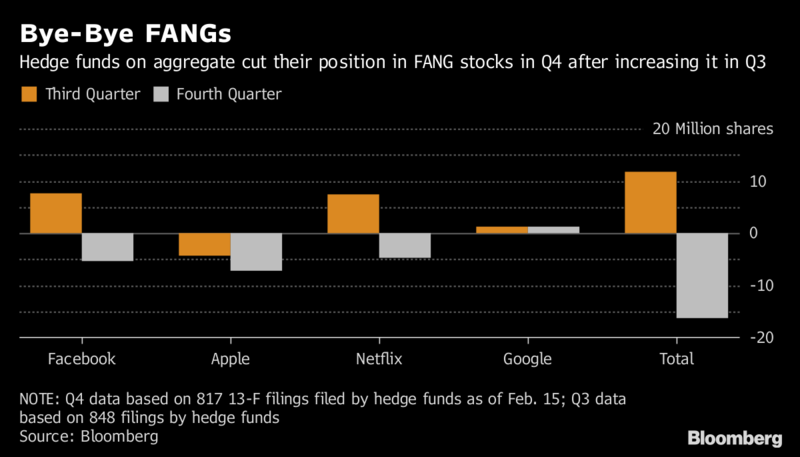 All told, hedge funds pared ownership of the FANG group by more than 16 million shares in the fourth quarter, an analysis of more than 800 government filings as of Feb. 15 showed. Just three months earlier, their position in the tech titans jumped by almost 12 million shares from a quarter before. This for companies whose shares added more than $600 billion combined in 2017. Speculators reduced positions in every FANG stock but Alphabet. Only firms with more than $100 million must file 13Fs. There’s more. As filings rolled in, evidence built that a consideration all but absent from the market over the last three years, valuation, may matter again. Hedge funds swooped in on handful of beaten-down companies, including Twitter Inc. and General Electric Co. Snap Inc., the photo-sharing app maker that quickly sank below it’s initial public offering price and stayed there for most of last year, is also showing signs of life, having rallied 52 percent in February after fourth-quarter results beat estimates. Confidence in tech titans skyrocketed in 2017 as the group added almost 50 percent, becoming one of the most-crowded trades. As prices soared, so did pressure to jack up earnings and justify stretched valuations. Hedge funds in the aggregate cut their position in Apple Inc. by 7.3 million shares in the fourth quarter. They decreased their position in Facebook Inc. by 5.3 million shares, and sold a net 4.7 million shares of Netflix Inc. They owned 300,000 fewer shares of Amazon.com. increased its Apple exposure, becoming the fourth-largest holder. Appaloosa Management boosted positions in Apple and Facebook, as well as buying up more of the PowerShares QQQ Trust Series 1 ETF. Third Point took a new stake in Netflix Inc. and scooped up more shares of Google. The interest, however isolated, can be explained by the high dispersion among sectors last year as correlations hit rock bottom, according to Josh Lukeman, head of ETF market making in the Americas at Credit Suisse Group AG. “It’s a manifestation of portfolio managers’ willingness to put chips on the table with group or industry bets, like tech, energy or pharma,” Lukeman said. Of course, technology companies are not just the FANGs. And while the megacap stocks’ valuations may be extended, the multiples for the overall tech industry are nowhere near the peak. Tech stocks trade at 18 times forecast earnings, not far from the S&P 500’s multiple of 17. At the height of the internet frenzy, the group traded at a 44 percent premium.